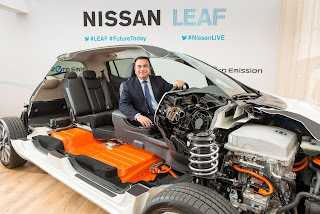 On Monday 8th April, Nissan President and CEO Carlos Ghosn hosted an intimate gathering of media in Oslo, Europe's electric vehicle capital, and spoke about the new Nissan LEAF and his vision of zero-emissions mobility. "The momentum is building around electric cars," said Mr. Ghosn. Sales of the Nissan LEAF surpassed 1,300 vehicles in March in Europe, and exceeded 2,200 in March in the United States. Customers who drive the LEAF are helping make it a success. More than 90 percent drive their LEAF every day, and 93 percent of European customers come from other brands, Mr. Ghosn explained. Additionally, 93 percent being very satisfied or completely satisfied with their Nissan LEAF. The new LEAF, which launches in Europe this summer, brings more than 100 changes influenced by customer feedback, including increased real-world driving range, reduced charging time, and bigger boot space. "The Renault-Nissan Alliance has sold more electric cars than the other major manufacturers combined," said Mr. Ghosn. "The LEAF is not one car. It's a vision."